Zenware and RoadFS was pleased to join the elite 2018 Air Force One Detailing team to restore the historic and world-renowned Air Force One. Zenware was one of the keys sponsors of the annual Air Force One Detailing event. Two of the partners, Rod Puzey and Jody Sedrick, spent the entire week working side by side the elite preservation team to help preserve Air Force One and 19 other planes at The Museum of Flight in Seattle Washington. 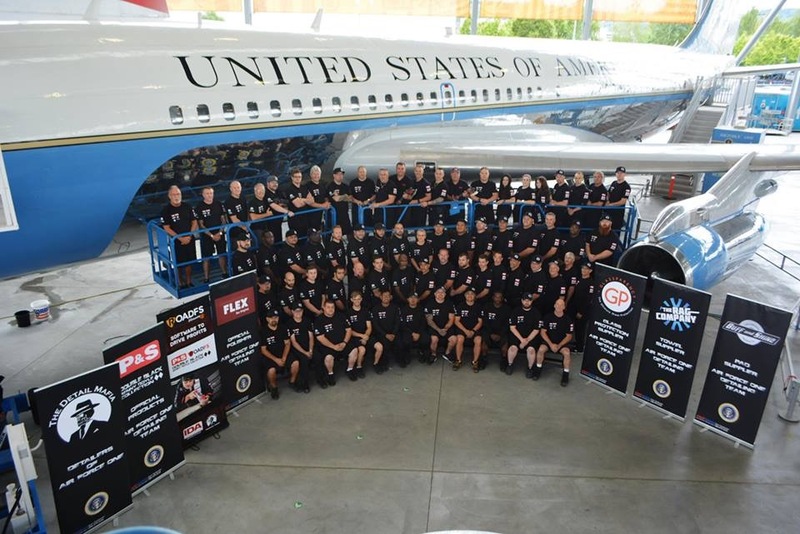 The annual event is run by industry leader and master detailer trainer Mr. Renny Doyle and his wife Diane who hand-selected master detailers for the 2018 Air Force One Detailing Team. 60 Master Detailers from all over the country, including Alaska and Hawaii, flew into Seattle for a week of restoration and preservation work. “There is no other project like this in the world and no other team that could pull this off”, commented Evan Eliott curator of The Museum of Flight, at the conclusion of the week. 2018 marks the 15th year of this amazing event where these men and women volunteer their expertise and services to literally preserve history. Everyone on the team takes part in the restoration of the very first Air Force One that was used by Presidents Eisenhower, Kennedy and Nixon. Former military and active duty military personnel are honored to polish the United States Flag that is proudly part of the tail of Air Force One. We then shifted our restoration efforts on an additional 18 planes including a B29 Bomber, B17 Bomber, 747, 787 along with other historic Bomber.nd a new edition to the fleet a B52 Bomber.